BIG Studios' "Market City Center: City Living" earned 2 ADDY Awards on Thursday. CHATTANOOGA, Tenn. - March 15, 2019 - PRLog -- Braly Image Group Studios (BIG) was recently honored by the American Advertising Federation (AAF), Chattanooga Chapter, with two bronze ADDY awards at the annual American Advertising Awards which took place at The Edney. The ADDYs, which honor excellence in advertising, recognized BIG Studios for their online video produced for the Market City Center titled "City Living", which was produced in the fall of 2018. 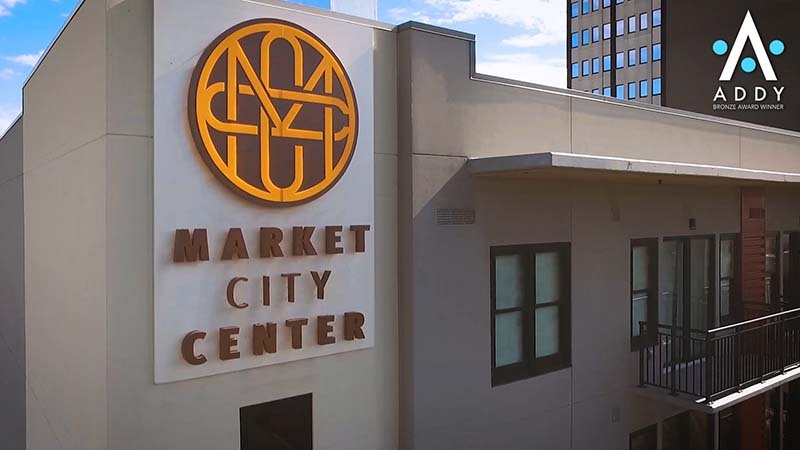 "With so much new construction happening in downtown Chattanooga over the last few years, particularly residential, Market City Center wanted to stand out above the other offerings. Our partnership with the talented Maycreate agency on this project took the production to another level," said BIG Studios CEO Chris Braly. "We worked with a dozen actors and models along with our nimble and talented 5-person production crew and somehow managed to shoot the entire video in a half-day. Overall, it was a success. Taking home an ADDY is quite prestigious and I for one am certainly proud of everyone involved." The two awards, a Bronze ADDY for Film, Video & Sound, Branded Content & Entertainment for Online Film :60 Seconds+ and a Bronze Addy for Film, Video & Sound - Internet Commercial, were the result of the company's creative execution that wound up netting BIG Studios over 200,000 views and interactions for the online film. "Telling a story is paramount in any branding video and tying it to a coordinated cross-channel campaign is essential for businesses in today's digital age," said Mark Gill, BIG Studio's Director of Sales. "With our talented team, we knew we could bring the production "magic" necessary to create a stellar product that would connect with our client's target customers and prospects to achieve their goals. We couldn't be happier with the results and the client loved it. Winning two ADDYs is just the icing on the cake!" Chris Braly noted "The BIG Studios team is unique in terms of the creative skills each member brings to the table. Most corporate clients lean heavily on our strategic and creative capabilities and really don't involve themselves with that process, but on this project I have to credit the team at Maycreate with taking this project up a notch in terms of concept. Brian May runs a very successful agency along with maintaining a fabulous team. And, unlike a lot of ad agencies, they're a great problem solving partner on set. I think the results speak for themselves. Being recognized by the American Advertising Federation, especially when this area is filled with incredibly talented production teams, is a nice bonus for a job well done." Learn more about Braly Image Group Studios at http://www.big-studios.com or http://chrisbraly.com.